Having this colorful beanie in my closet for some years now, I decided to give it a try and started wearing it again. I like it because it’s different with the pattern and all those colors. The headwear and a warm coat are a must in these days, don’t let the sun fool you (it only came around today, but the temperatures were still just above freezing point). This Nike coat is one of my favourite winter pieces, because it’s very soft, warm and well made. 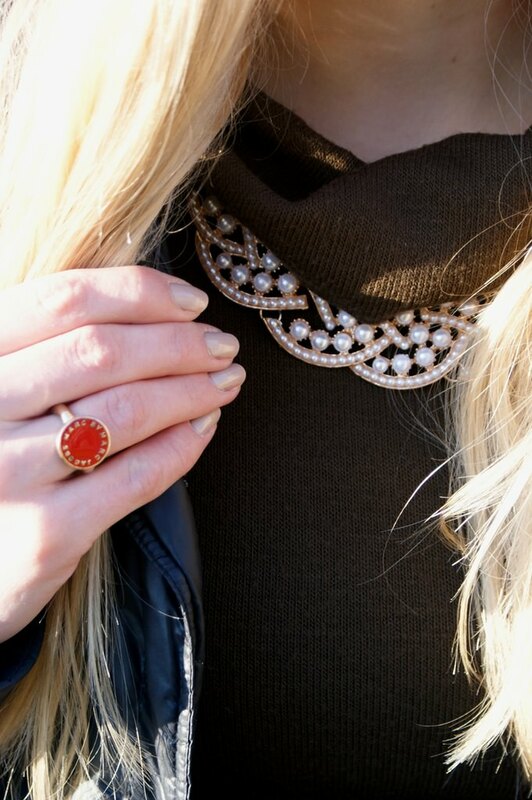 A simple long sweater/tunic is made more interesing by a vintage pearl necklace and red sealing Marc Jacobs ring. That first photo is GORGEOUS !!! You are so beautiful !! And I love your beanie !! Great winter look ! YOU are so beautiful! thank you for the comment darling!!! hi, i love your style and ur blog so much! I found your comment on my blog for follower ..
great beanie! You look amazing! Thank you for your comment on my blog dear!! By the way you look really great in these photos! beautiful hair<3 so pretty! amazing ring! Well you should wear it more often!!! You loo great!!! Beautiful pictures, i love your hat! You look beautiful… love your ring:)xoxoLaura! I love this trend, and looks great on you! such a cute beanie <3 Love your outfit!!!! I seem to be living in my beanies in this weather, super snug and stylish!! thanks for visiting my blog, by the way! i'll be sure to check yours often, now that i've found you! Beautiful colors and print on that beanie! Beautiful shots! The closeup is so pretty!